Pick Analysis: The Chicago Tribune named Saubert a top-five player in the Mid-Suburban League, but FBS teams apparently didn't see the potential. Drake's coaches did, however, and they were handsomely repaid for their foresight. Saubert started nine games and was a first-team All-Pioneer Football League pick as a redshirt freshman (47-549, two TDs). He missed three games due to injury in 2014, but still earned honorable mention all-conference notice (seven starts, 32-348, two TDs). Over the past two years, the Bulldogs' top receiver was a first-team all-conference pick and an All-American, winning third-team honors from the Associated Press as a junior (55-580, seven TDs) and second-team accolades in 2016 (56-776, 10 TDs). 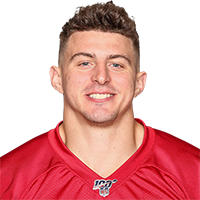 Published: April 29, 2017 at 03:32 p.m.
Bradley Anthony and the Bellwood Boys & Girls Club announce the Atlanta Falcons selection of Drake tight end Eric Saubert in Round 5 with the No. 174 pick overall in the 2017 NFL Draft. Published: March 30, 2017 at 10:12 p.m.
Drake Bulldogs tight end Eric Saubert goes through drills at the 2017 NFL Scouting Combine. Published: April 12, 2017 at 07:56 p.m.
Everything you need to know about Drake tight end Eric Saubert.